This entry was posted on March 20, 2018 by Jessica Anderson. With flowers blooming, days getting longer, and birds singing, spring is here, finally! It has been a long, wet, dark winter here in the Pacific Northwest. Spring really can't come soon enough! The quintessential spring holiday is Easter and it's just around the corner! Many communities have a tradition of an Easter Egg hunt either the Saturday before Easter or on Easter Sunday. Here's how to make your egg hunt a success! 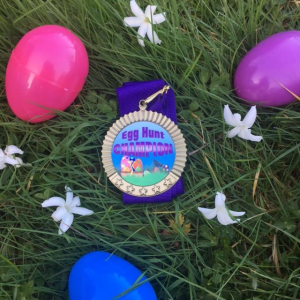 Easter medals make great prizes for fun runs and egg hunts! Want to have an Easter Egg hunt but don't know where to start? Let me help! Step 1: Figure out who's coming to your hunt. An easter egg hunt for toddlers is much different than a hunt for teens. Decide who the hunt is for. Step 2: Determine the location. Outside or inside? For little kids, they may need help finding eggs, so a wide open space where the eggs are easy to see may be a good choice. For older kids and teens, make it hard by hiding eggs in tricky spots. This may require a location with lots of nooks and crannies where eggs can be hidden out of sight. Step 3: The Eggs. First you need to have enough eggs so that everyone feels successful. The age of the kids will determine what treasures you put inside your plastic easter eggs. For little kids, it may be a small piece of candy, a little toy or a coin. For older kids, you may want dollar bills and more candy. Get creative! Step 4: Hiding the eggs. Adults hide the eggs before the event. Again, depending on the age of the kids, you can make them easier or harder to find. And NO PEEKING! Step 5: Once it's time to hunt, let the kids loose with their baskets! My teens still LOVE Easter egg hunts! - if you have a number of different age groups, you can separate by egg location (for example, only the little kids are allowed to get eggs on the grass). -Assign each child a color and they are only allowed to find eggs of that particular color. -Pair little kids and big kids together on "teams" where they split the loot at the end of the hunt. -Create an egg scavenger hunt with clues leading from one egg to the next. -Award the top egg collector a Bunny Trophy! -Give personalized medals to all the kids at your hunt. I hope these tips help you plan an epic hunt. Check out our Easter Awards for the perfect prize for your hunt. Wishing you a wonderful Easter and a great time making memories with your favorite kiddos! Editor's note: This post was originally posted in April 2017. It has been updated for content.